Protecting your hearing is a vital part of safety too often ignored; these compact electronic earmuffs protect the ears against noise levels higher than 85dB and keep you in comfort at the same time. Solid state circuitry allows normal speech and sounds to be heard but automatically deadens any noise above the 85dB threshold. The on/off switch with adjustable volume control extends battery life to about 200 hours and uses 4 AAA batteries (not included) - no special battery pack to worry about! 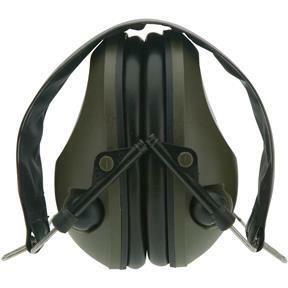 Ideal for shooting, hunting, construction, aviation, factories, motor racing, and more! Includes an audio jack for use with smartphones, radios, or MP3 players. Olive green color. 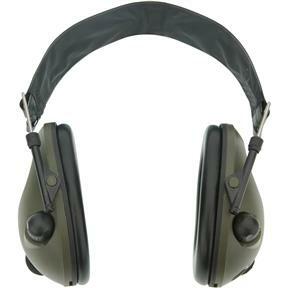 24dB Noise Reduction Rating (NRR) and tested and approved to European Standard EN352-1 and ISO 4869-1. These earmuffs are OK for the price but are not of the highest quality. You have to take the earpiece apart to put in the batteries (in both ears) and in general, these have a lightweight feel, not a feel of high quality. But hey, you get what you pay for and they do work, so mission accomplished. Lightweight. Nothing fancy. 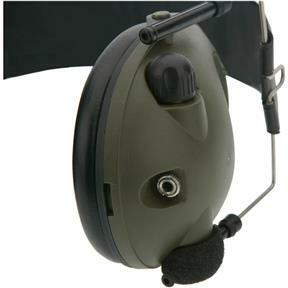 There are better earmuffs that use less batteries and have only one 'on' switch. But on the rang it works fine.